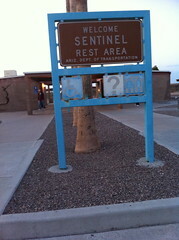 Totally, did not plan on doing any posts on stuff before we got to San Diego, but that was before we realized the very odd set up of the Sentinel Rest Area on the I-8. They have a picnic spot specifically designated specifically for wheelchairs, but for some reason there is absolutely nothing under the ramada. Seems like this would thus be a negative review, but it is not. 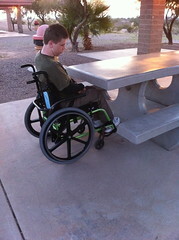 While the rest of the picnic table areas are not designated as accessible, they actually all seem to have concrete picnic tables that a wheelchair can rather easily and comfortably roll up to and use. It just struck us as very odd that the accessible spot had no table, yet the whole place was rather accommodating since a wheelchair could sit at any of the picnic tables. 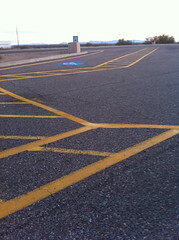 So, that just left us wondering why even need a place designated accessible? It is not like the path to it seemed any better or anything. Sure it probably was the closest to the handicap spots, but without a table it sure is not useful for people that use handicap spots for stamina type reasons. Of course, it is very likely at one time it did have a table. 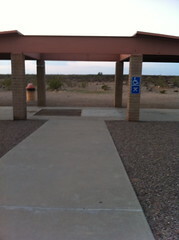 It also has an RV handicap parking spot.